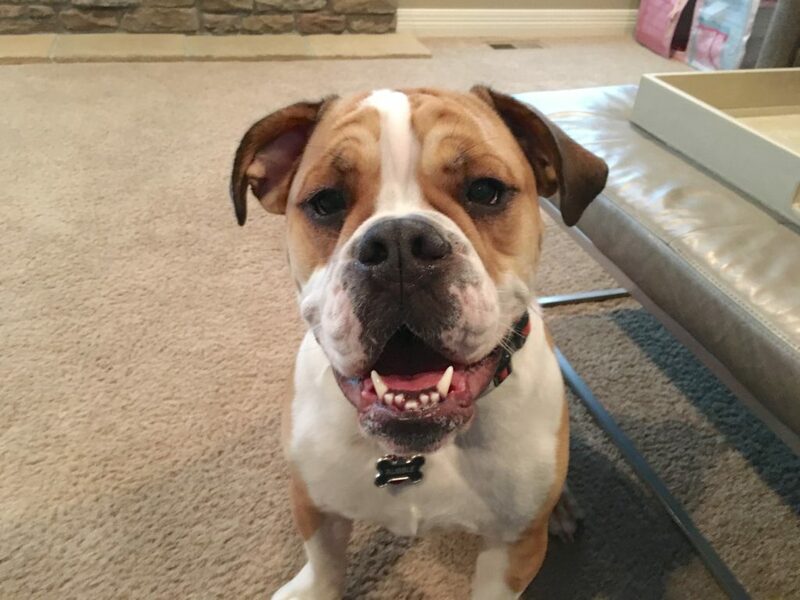 Rubble is a one-year-old Old Engligh Bulldog who lives with a family in West Omaha. His guardians set up this dog obedience training session to stop him from getting so excited he cant listen, chewing and stop jumping up on everyone while invading their personal space. Rubble gave me a first hand demonstration of his excitement and lack of respect for personal space as soon as I arrived for the session. I did not try to really engage with Rubble and certainly did not try to pet him while he was in the over excited state. Anything a dog is doing when you pet it is what it thinks you are rewarding. So petting an excited dog who jumps up and invades space, will make the dog jump up and invade space even more in the future. When we moved into the living room, Rubble got all revved up again. In fact, he got even more excited than in the first video and had trouble controlling himself. His guardians laughed and told me that was normal for him. Unfortunately it had gotten so bad that the family’s kids were now shying away or outright avoiding him out of frustration and annoyance. I pulled out a chain leash and attached it to his collar before stepping on it about two feet away from where I clipped it on. I call this a leash time out and have found it to be an excellent way to disagree with over excited energy and behavior. While the leash time out can help settle a dog down, it only works if the dog is NOT filled with too much unspent energy. While they are often perceived as lazy or fat dogs, Bulldogs are usually quite athletic and have good energy. Not as much as a lab or pointer, but enough that it can become a real pain if not dealt with properly. I recommended that the guardians increase Rubble’s daily exercise and start a journal of these efforts. I have some clients who use a morning walk, mid day game of fetch and what I call maintenance fetching a few additional times in the evening. The fetch is a great way to burn off a dog’s energy as they get to run at full speed in pursuit mode which is a much better work out than a walk. Dint get me wrong, a walk where the dog heels is a great way to help it develop respect for us as a leader (something Rubble needs badly), but its so slow that for most dogs, it leaves them unsatisfied in terms of burning energy. If we don’t help the dog unleash this pent up energy, its not appropriate for us to be upset with the dog as we are not providing it with that it needs to succeed. The family should vary the daily exercise activities and keep noting them in the journal until they find the right combination that results in a dog that result in a Rubble who displays the behavior and energy they want. But while burning off Rubble’s excess energy is going to really help, its not going to solve the behavior problems. I spent an hour going over new ways for the humans to interact with the dog, delay gratification to help him develop more control and add structure to ever day activities like petting to help him start to see the humans as having more authority so he starts treating them more respectfully instead of his play things. I also went over a series of escalating consequences I developed a few years ago to disagree with unwanted actions and behaviors. These are modeled off of how dogs communicate and interact with one another so most dogs pick up on them immediately. To help the family members practice using them, I walked them through a leadership exercise that requires the dog to ignore, and eventually give up on trying to get a high value meat treat laying in the middle of the floor. I ran through he exercise a few times until I knew Rubble understood what I wanted. Once that was the case, I coached all the members of the family though it until they had the same results. It took some time, patience and determination, but eventually, even the youngest of the family was able to successfully run though the exercise with Rubble. Increase Rubble’s daily exercise while journaling the activities and results to find the right combination. Use the leash time out any time Rubble’s energy gets out of control (but first make sure his energy has been burned off). Pet Rubble with a purpose so he starts to identify as a follower who has to ask for attention instead of demanding it. Avoid petting Rubble any time he is in an over excited state of mind. Introduce rules and boundaries and enforce them consistently within 3 seconds to help Rubble learn what is and is not allowed. Use the escalating consequences to disagree when Rubble breaks a rule or boundary. Get into a habit of claiming everyone’s personal space and not pet Rubble when he gets too close without an invitation. Practicing claiming the door so Rubble learns to keep a respectable distance when guests arrive and not get over excited. Practice the Leadership exercise daily to help the humans get better at using the Escalating Consequences and Rubble learn to respect them.